1. Players must collect footballs for points. 2. Players (while normal sized) must avoid Blitz Botz so they wont get knocked down and waste time. 3. Players can collect shield coins to make themselves bigger. 4. While large, players can run over Blitz Botz to gain additional time and remove them from play for a few seconds. 5. After so many seconds, the player returns to their normal size. 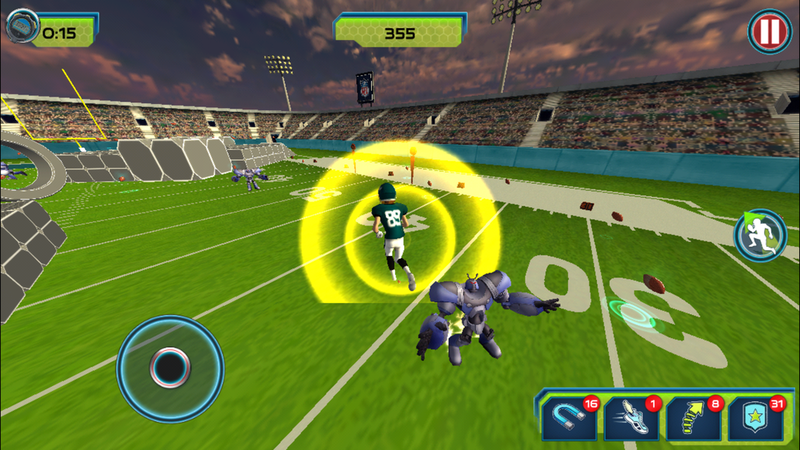 In D-Dash, players have sixty seconds to collect footballs to score points. They must avoid enemies running around the field, or they will get knocked down for a few seconds. Players can collect NFL shield coins to grow larger for a few seconds, and gain the ability to tackle enemies and briefly remove them from play. Tackling enemies also grants players bonus time. All collected footballs and shield coins respawn after 40 seconds. D-Dash is probably the minigame I had the most fun working on. The previous designer got moved to a different project so I inherited it a month before release. It was also our worst testing minigame. The initial build had the player running around collecting footballs for points while avoiding enemies for sixty seconds. I was tasked with making the game fun. The first big change I had to make was with the camera. The initial set up kept the camera locked to the immediate rear of the player. This made it nearly impossible to navigate the raised platforms, and jumping and running around became a chore. I worked for two and a half weeks to get the camera fixed (I used Super Mario 64 as my example, and the amazing programmer I was working with helped me to achieve that goal). During this time, I also adjusted the gameplay to be a little more like Tackle Trouble. The player could collect shield coins to increase in size for a few seconds. During this time, the player could run over enemies to temporarily remove them from the field, but it still wasn't quite fitting. During the last week and a half, I realized the biggest problem was the maps. Due to the restrictions of mobile devices, we couldn't have multiple levels and huge, sprawling exciting areas. So I had to figure out a way to make the area feel larger than it was while actually making it smaller. 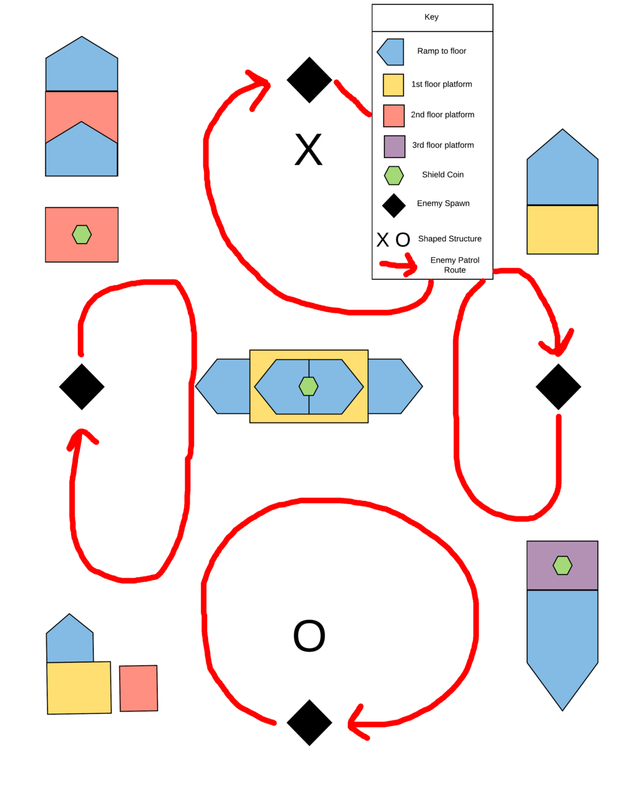 My solution was to rearrange the pieces and create hot spots as I had seen several games use with great results. Essentially, I created danger zones where the player was very likely to engage enemies. But I had to make these areas rewarding to enter. So I put the items which gave the players the ability to gain bonus pints and obtain extra time near the highest concentrations of enemies.